Creating with food is Chef Bob Sferra’s passion. Born into a big Italian family, cooking symbolizes everything that he loves. A graduate of John Carroll University with a marketing-business degree paved the way for his culinary career. As a chef’s apprentice he helped Parker Bosley create The Cleveland Restaurant School. He was fortunate enough to attend the Cooking School at the Ritz-Escoffier in Paris, and won a scholarship to attend L’Ecole Lenotre in Plaisir, France. After earning a Grand Diploma in Pastry Arts from The French Culinary Institute in New York City and upon returning to Cleveland, Chef Sferra served as the Pastry Chef at the Inn at Turner’s Mill in Hudson;Executive Chef at The Harp-Irish Pub; chef at The Foundation House on the main campus of the Cleveland Clinic and the Culinary Director for a local Culinary Arts Center. 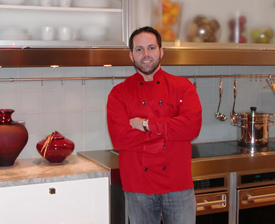 In addition to managing his growing culinary and events business, Chef Bob currently serves as the Executive Chef Consultant for Trevarrow, Inc., Northeast Ohio’s leading Wolf and Sub Zero appliance distributor. He has made multiple television appearances, as well as being a published food writer and culinary consultant. He and his staff are fiercely passionate about attention to every detail, and continue to be recognized as leaders in the culinary industry in Northeast Ohio.